Stuffed vegetables, especially zucchini, is found throughout our cuisine. These are commonly eaten on special occasions, such as Shabbat and holidays. Stuffed Cabbage is a community favorite. Like many other dishes we feature, it may be eaten at room temperature, making it a popular dish for Shabbat. These little savory pies can be found as an appetizer in most every traditional Karaite household. The recipe for the dough has been shared from cook to cook with slight variations. These were made together with the talented hands of Lilian Mourad. Filo dough is a staple ingredient in the Middle Eastern Cuisine and is also prominent within the Karaite Kitchen. 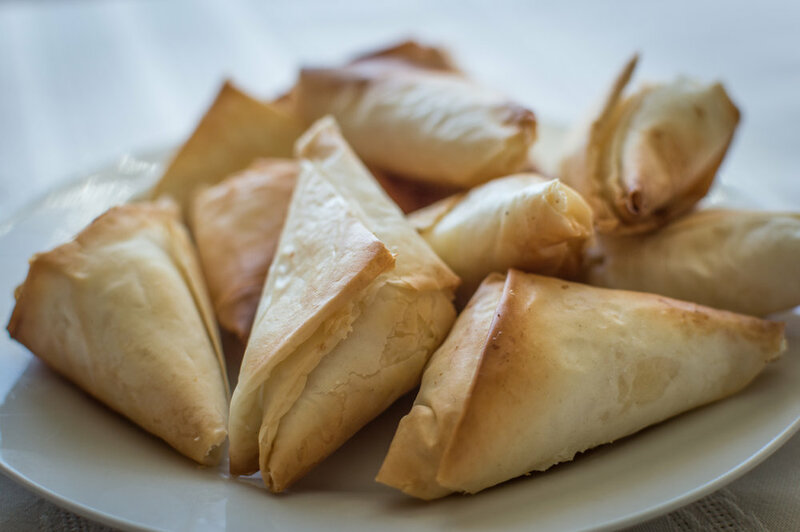 Filo dough triangles are a popular recipe that bakes filo sheets with various fillings such as cheese or meat.